Is viNGN an ISP (Internet Service Provider)? No. viNGN is not an ISP, but a wholesale, middle mile service provider. An Internet Service Provider (ISP) delivers Internet connections to homes, offices and institutions. The ISP is paid directly for these services. To feel the speed of viNGN’s open, 100% fiber optic network, contact one of the ISP partners that utilize viNGN’s middle mile network. What are the main advantages of a 100% fiber optic network like viNGN? What is unique about the viNGN network? viNGN is a 100% fiber optic telecommunications network that interconnects St. Croix, St. John, St. Thomas and Water Island, and then connects the U.S. Virgin Islands to the world. It is the only network of its kind in all of the U.S. states and territories. viNGN is a neutral open network, which means all ISPs are welcome to apply to be partners. The design of the viNGN network also allows PEERING. Simply put, Internet traffic between local servers stays local, while information that must travel outside the USVI takes its own path. Think of it like an intricate “expressway” system that can be set up in many different ways. This allows the viNGN network to deliver even faster and more efficient speeds. Can I buy Internet directly from viNGN? How do I request fiber optics at my home or business? View the FCC’s Household Broadband Guide for estimations of speeds needed to accomplish most tasks today. How fast is my Internet speed? Visit SpeedTest.net to check your Internet speed. What do I do if I have problems with my Internet connection? If you receive your Internet service from a viNGN ISP Partner and you experience connectivity issues, your first point of contact is always the Internet Service Provider (ISP), not viNGN. You will not be able to report connection troubles directly to viNGN to have them resolved. Whom do I contact if I have technical issues at my PCC? If you are visiting a Public Computer Center (PCC) and experience problems, immediately report them to the Site Manager. Public Computer Center Site Managers, if your PCC is unable to connect to the Internet, contact your Internet Service Provider (ISP). However, for non-Internet related issues (hardware, software or settings issues), please contact viNGN PCC Manager Anita Davis at (340) 715-8581 x2244 or email adavis@vingn.com. How were Internet speeds in the USVI before viNGN? Due to lack of adequate demographic and infrastructure data available for Puerto Rico and the U.S. Virgin Islands in the Caribbean, and Guam, American Samoa and the Northern Marianas in the Pacific, these areas were excluded from the majority of the FCC’s Broadband Availability Gap analysis. 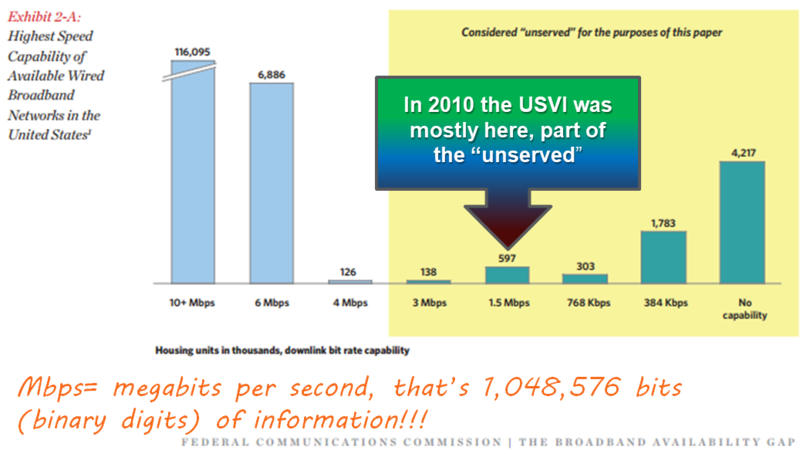 But, to give an idea of where we stood, a minority of individuals living in the USVI registered having “high speed” access at only 1.5 megabits per second as opposed to dial-up Internet service. The FCC’s Household Broadband Guide gives estimations of speeds needed to accomplish most tasks today. viNGN came about as a result of a U.S. Federal Government study that indicated that many Americans did not have access to Internet speeds that would bring about Digital Equity. The concept of Digital Equity calls for equal information communications technology footing for the pursuit of personal, professional and social mobility. This Federal Communications Commission (FCC) study was launched to address what was called the “Broadband Availability Gap” (2010). The National Broadband Plan included grant funding that was pursued in 4 key areas. You may download a copy of the report here, and view viNGN’s About Us page for more information on the grants obtained and our mission statement. viNGN provides world class open access, high speed, all-fiber optic broadband connectivity. With speeds up to 10 Gbps, viNGN has made the Virgin Islands the only fully interconnected jurisdiction of all 50 states and 6 territories, and leads the Technological Revolution. viNGN is committed to the continued broadband infrastructure, economic, and community development of the U.S. Virgin Islands. What is the viNGN mission? To provide high quality wholesale broadband products and services to Internet Service Providers (ISPs) throughout the Virgin Islands. To be the premiere provider of high-quality broadband based landline and mobile products & services, enabling economic prosperity throughout the Virgin Islands. Where are U.S. Virgin Islands on internet availability? The United States Virgin Islands has gone from a virtual 0% in terms of broadband internet availability, to being included in the National Broadband Map. This map covers fixed (wired) broadband deployment. Due to the topography of these islands, many ISPs incorporate wireless technologies to connect their customers to high speed internet services. There is a list of viNGN ISP Partners on our web site. The FCC Broadband Progress Reports provide a nationwide overview of progress in the quest towards achieving Digital Equity. Have prices gone down since the completion of viNGN? viNGN sells broadband speeds at wholesale to ISPs and they in turn pass along savings to you. It is important to note the value while considering the price point. For example, in 2013 one viNGN ISP partner had a $49.95 price tag for residential service that delivered up to 2 megabits per second of speed; today, this package delivers up to 5 megabits per second, or more than twice the speed at the same cost. But also in 2013, the 5 megabit package was considered a deluxe plan, and cost 99.95 per month. By contrast today, that same $99.95 per month package provides up to 25 megabits per second. Why do USVI prices still seem relatively high? Whenever a new technology is adopted, the startup costs are high. The combination of market competition and more people signing up makes things level out. An important thing to keep in mind is the number of potential customers, which are in the millions in most other places. The USVI has a population of well below 200,000. All technological advances cost in the tens or hundreds of thousands of dollars, and pricing must allow companies to pay for all improvements over time. It is difficult to assume that Internet prices in the U.S. Virgin Islands will ever match what is possible with larger markets. How do I become a viNGN partner? Please contact viNGN via the Contact Us page, and let us know that you are interested in partnering with viNGN. For information on the range of products and services available, visit our Services page. I need fast Internet. How do I find a viNGN partner? Both residential and business services are available through viNGN ISP Partners. Visit vingn.com/isp-partners, or download the list with contact and other details.